Let’s celebrate a fantastic summer with a giveaway! Our friends at LEGOLAND® Discovery Center Boston are offering tickets for a family of four (good for one year). The giveaway marks LEGO Master Model Builder Megan Quigley’s visit to Portland Sea Dogs stadium this Sunday, August 28 at 1:00 p.m. Megan will be sharing some of her favorite baseball-themed LEGO creations, providing tips to aspiring builders, and throwing out the first pitch at the game. Megan Quigley helps kids build fun creations at LEGOLAND® Discovery Center Boston. Interested in winning tickets to LEGOLAND® Discovery Center Boston? All you need to do is comment below. 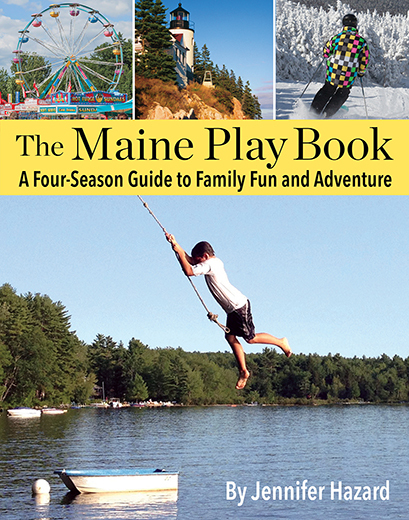 We want to know all about your family adventures in Maine this summer! Where did you travel? And what did you do? Contest ends Thursday, August 25, 2016 at midnight EST. Good luck! PS: Our visit to LEGOLAND® Discovery Center Boston and what it’s like to be a LEGO Master Model Builder. In Maine our family has enjoyed trips to beaches, state parks, and enjoyed Fourth of July at Lake Pemaquid Campground and visited Pemaquid light house. On Father’s Day weekend we took advantage of dad’s get-in free and visited Funtown/Splashtown for the first time with our three year old. The best/sweetest in Maine for us is the Great Falls Balloon Festival in Lewiston/Auburn which was this past weekend. It’s our hometown and even though I’ve been to balloon launches for 25 years they are always magical. What a great giveaway! Our favorite Maine trip was to Rossport Farm in Eastport, right on the ocean – it’s a magical place. We have done a lot of traveling by way of kayaks! It’s new to us, and we try to paddle someplace new each time. So far our favorite place has probably been Taylor Pond in Auburn. Kayaking had turned out to be a great family activity for us! Mostly beachin’ it thus far… Would love to win a field trip to Legoland! We love our summer staycations all around Maine! Our fave daytrip this summer was to the Gosling Islands, but we’ve had lots of other fun adventures, too, from Kittery’s Fort Foster to the midcoast and Acadia to Eastport! Right now we’re trying to cram as many more outings as possible into this last (sniff, sniff!) week before school starts! Our favorite trip was to Peaks-Kenny state park camping. Lot’s of fun! We didn’t do much traveling as this is the first summer with our pool, and we tried to use it on every sunny or semi-sunny day! We live in Maine so we get to see quite a bit of it year round. Our favorite times are spent on or near the water, both inland and on the ocean. Earlier this summer we had a wonderful ye visiting Peaks Island and renting golf carts to tour the island. We got a chance to see a few of the WWII emplacements as we circumnavigated the island. We finished up with diving from the wharf into Casco Bay, dinner at the Inn on Peaks, and some ice cream while waiting for the return ferry to Portland. We are very lucky to be living in this beautiful coastal city. We enjoyed a visit to Peaks-Kenney State Park and get to Popham and Reid State Parks whenever possible. We had some great adventure this summer, one of our favorite things to do is camp at Acres of Wildlife. I grew up camping there and now my kids get to experience it also. We also crescent beach and caught and released hermit crabs, so much fun! Our favorite Maine day trip is at Winslow Park in Freeport! It’s a wonderful place! We had a wonderful summer in Maine! Lots of small day trips and activities, but the highlight was our first family camping adventure to Cupsuptic Lake in Rangeley. It was gorgeous there and our hike to Angel Falls that same weekend was just beautiful! Swimming in the peaceful and calm lake, looking for a moose and enjoying delicious s’mores by the campfire made for one of our favorite summer memories. Our favorite day trip is Popham Beach State Park. But my hands down most beloved place in Maine (and maybe even on Earth!) is Acadia National Park. We camped there every summer when I was a kid and I hope to start taking my own children next year (we have 4 boys). Our favorite day this summer was hunting for Pokemon at Fort Williams Park! We saw a Pikachu but couldn’t catch it. So, we walk around our neighborhood a lot enjoying Maine summer evenings and still looking for Pikachu. We love Legos and haven’t had a chance to get to the discovery center yet… would love to share this opportunity with our kids!! on August 23, 2016 at 7:01 pm | Reply Sarah B. We spent the time as a family mostly day tripping to Story Land, Pinelands, the beach, the pool, spent time with family and friends, and tried to soak up as much fun and sun as possible! Our family loves to be outdoors during the summer. We have a park pass and go to Wolfe’s Neck State park and head to Popham when it is beach weather. We just recently visited the Topsham Fair and enjoyed watching the monster trucks. My two boys are three and four years old and have never been to Lego Land. Had a great summer. Our vacation was upta camp. Some of our favorite weekends included the Kite festival in portland, the old port fest and ferry beach in scarborough. I love maine! We are relatively new to Maine and have enjoyed exploring. This summer we’ve discovered Smalls Falls, the Wire Bridge in New Portland, and enjoyed favorites like Old Orchard and Popham Beach. We have done a lot of swimming! Along with the aforementioned, we have also splashed around Sebago Lake, Kennebec River, North Pond, Randall Pond, Sandy River, and Houston Brooks Falls. We went to our two favorites-York and Bridgton. I have been going to York since I was 6 months old, and my husband has been going to Bridgton since he was in grade school. Love that we are passing these traditions to our 3 kids, who now love both of these spots! It’s been a busy summer of camping on Moosehead Lake and beach adventures at Winslow park, Sebago Lake, Range Pond, Bear pond & Sabbathday Lake. Would love to head to the Lego Discovery center! Lots of day trips along the coastline beaches from Boothbay to lottery. Love living in Maine! We’ve made a lot of great memories this summer but our favorite times have been beach trips to sebago, drive in movie nights and lot of ice cream trips! We went to Star Island NH All-Star I conference. But biggest adventure moving back to Maine after sabbatical year in Virginia! We moved to Maine this summer-two weeks ago!-and that has been a great adventure. Looking forward to getting to know the are better and excited to have found this site! Every summer, my family of four goes camping somewhere in Maine that we have never been before. This summer, we picked Cobscook Bay SP and Quaddy Head SP. Both were fantastic, but the bogs at Quaddy Head were certainly a new experience that we enjoyed exploring. Who new that such beautiful and unique plants could grow on the Maine coast? Our children (4 and 6), also enjoyed being able to walk so close, yet safely, along the ocean’s cliff trail. Oh, and the lighthouse was cool too! Every corner of Maine truly has something wonderful to share!